When the residents of Bunker Hill discovered that the Alameda Street crib district prostitutes were living in their neighborhood, they drafted polite letters to the City Council and the Police Commission complaining about it. But when they discovered that a rowdy religious sect called the Burning Bush had set up its headquarters on Olive Street, they called the police straightaway. Scarlet women were one thing, but cult leaders quite another. 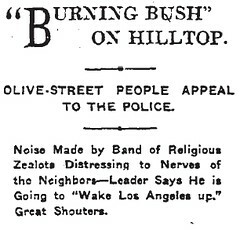 Based out of Denver, leaders of the Burning Bush flock came to Los Angeles in the spring of 1904, and wasted no time in luring converts. In addition to their base of operations near Angel’s Flight at 315 Olive Street, they also established a revival tent at the corner of Spring and Seventh. At meetings, their followers would regularly shout, leap up and down, speak in tongues, and fall into semi-catatonic states for hours at a time. So enthusiastic were their cries that neighbors claimed they drowned out the sound of the streetcar as it rattled up the hill. Despite the leaping, members of the Burning Bush were not to be confused with the Holy Jumpers, another evangelical sect that had come to Los Angeles around the same time. Though they operated on a similar set of beliefs, the Burning Bush was generally considered to be less objectionable than the Holy Jumpers because they were not quite so loud. Additionally, while the Burning Bush had culled its leaders from respectable cities like Denver and Boston, the Holy Jumpers were from Alabama (gasp). While the Burning Bush’s evangelical fervor made them strange in the eyes of their neighbors, it didn’t make them a cult. What made them a cult was their practice of quickly separating initiates from all their money, real estate, and worldly possessions. In 1906, a deaf man named Lorenzo Dunlap sued Burning Bush leader Charles Bryant to recover approximately $1000 worth of cash and property he’d signed over the cult with the agreement that they would hold the property in trust and care for him until he died. He’d feared that his own family members would try to have him committed to an asylum and swipe the estate for themselves. But instead, the Bryants did. Dunlap claimed that once the money had changed hands, he found the Bryants cold and unwilling to support him. Additionally, they promptly sold Dunlap’s property in North Dakota at a tidy profit and used the money to buy themselves a fine Los Angeles area home and a cow. It wasn’t just property they took. 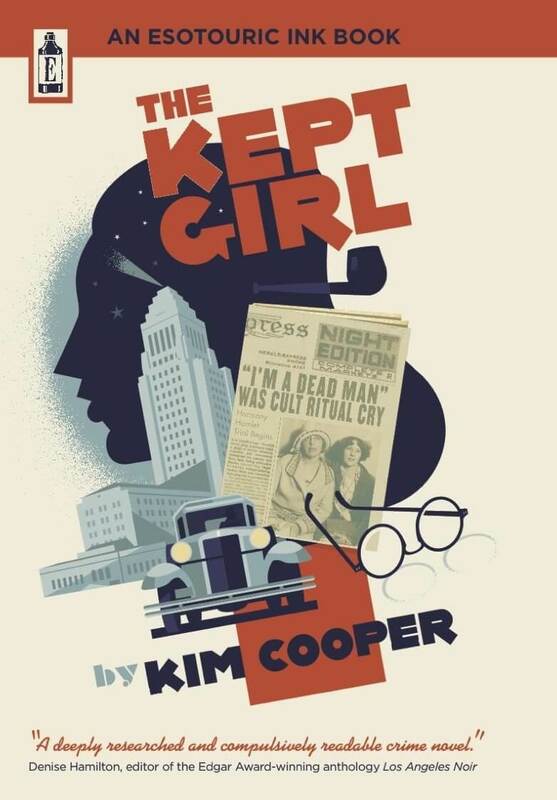 In 1905, a Mr. Vitagliano sent police to the Burning Bush house on Olive to find his 16-year-old daughter, Annie. Vitagliano said that the Burning Bush had torn his family apart, sending his wife off to Europe to do missionary work, turning his daughter against him, and constantly pestering him for money. One of the saddest Burning Bush casualties was a Mrs. Elizabeth Northcutt, who was committed to the State Hospital for the Insane at Patton in 1908, after years tangled up with the Burning Bush and another group, the Pillar of Fire. Northcutt’s husband, a butcher, had exhausted all of his resources trying to nurse her back to health, even after she had emptied his bank account and abandoned him and their son for the Burning Bush, before finally returning home, frail and raving. At her insanity hearing, Northcutt flew into a rage against his wife’s father, the wealthy James Murdoch, saying, "You ought to be ashamed of yourself for letting them send your only child to a public asylum when you are amply able to provide for her comfort." Murdoch coldly replied, "She is your wife and it is your duty to support her. I have done much for her in the past. I have had financial losses and have large expenses of my own. I see no reason why the State should not care for her." The examining physicians reported that "previous to ‘getting religion,’ Mrs. Northcutt was plump and merry. In two years, she has become a nervous wreck." However, they expected she would recover her senses in time.